Boating in Nepal is one of the interesting recreational things. It has glacier fed lakes up north to the gently moving rivers in terai, you hire a boat for couple of hours with guide or without guide, you can enjoy the moments with lots of sights near around you. 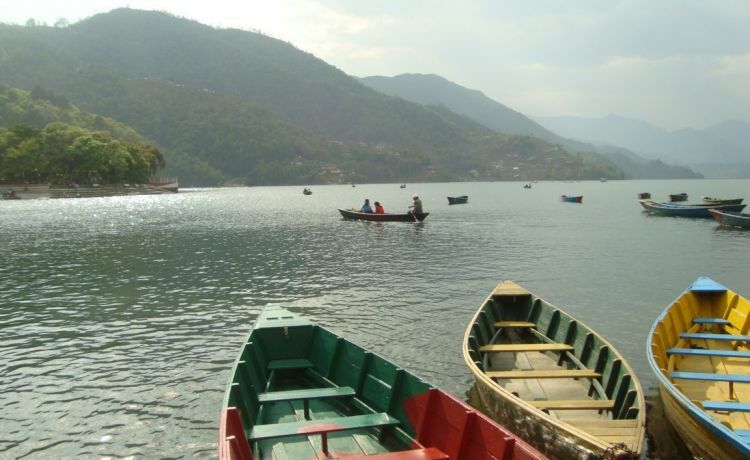 Phewa Lake is the second largest lake in Pokhara, the lake bordering the forested hill. The view of Fishtail and other mountains reflected in the lake, the little island and the Tal Barahi temple in the middle, the white stupa on the top of the hill, the gliders jumping from Sarangkot, the Ultralight soaring up high and paralleled each other, buzzing, all at once can be seized in the mild breeze over the Phewa Lake. At Phewa Lake, you can choose what type of boats you would like to have, the driven boats (the old fashioned one joined two boats with planks and pedals in the middle), row boats and sail boats. There is also choice between fibred-body sailboats and wooden ones. You can do boating in Pokhara valley throughout the year except monsoon. Begnas and Rupa Lakes are also an excellent ‘boat lakes’. They have crystal clear water. These lakes have been separated by a forested hill named Pachabhaiya Danda and can be the nice retreat. Begnas does not have nicer hotels and lodges, it is better to make a day trip from Pokhara. Down in the Terai, the Narayani and Rapti rivers are famous for canoeing. The memory cannot be deleted being together with Gangetic dolphin in the Narayani and wonderful migratory birds, gharial, and other wildlife inside Chitwan National Park. Day 01Walk around Lake side & go for boating any time you wantPhewa Lake is very accessible for those who are in Lake Side in Pokhara. We can go on foot and get a boat. There are different points where we can have different types of boats. We can hire a person to paddle or we can do ourselves. We have to pay as per the time basis. The longer we take the boat with guide, the more money we pay. There is little island in between the lake where the temple dedicated to Tal Barahi is located. We can visit there and spend time walking around. Boating at Phewa Lake much more pleasure with the mountain view towards north of Annapurna massifs. The tempting moment is there when we see the reflection of Machhapuchhre (Fishtail mountain) on the water.